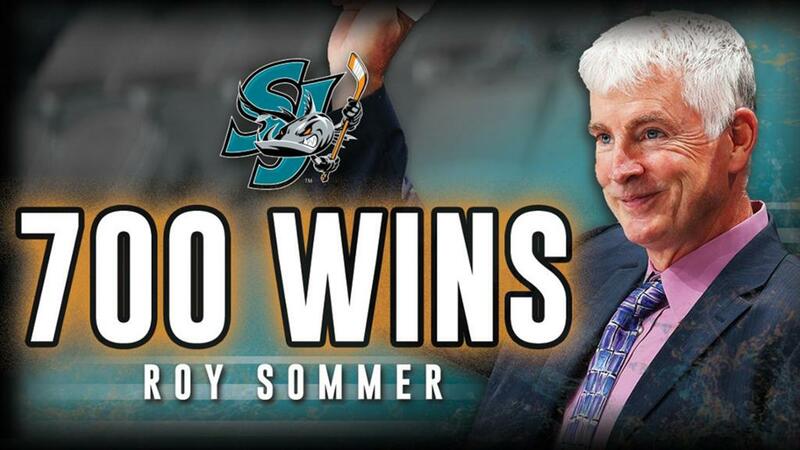 Oakland native Roy Sommer achieved yet another milestone in his illustrious coaching career when the San Jose Barracuda defeated the host Bakersfield Condors 2-1 on Dec. 3 to hand Sommer his 700th career regular-season American Hockey League (AHL) victory. Sommer, who surpassed the all-time career coaching wins of 636 posted by AHL coaching legend Fred “Bun” Cook two seasons ago, is alone at 700 wins. Amazingly, Cook’s record had stood since 1943. 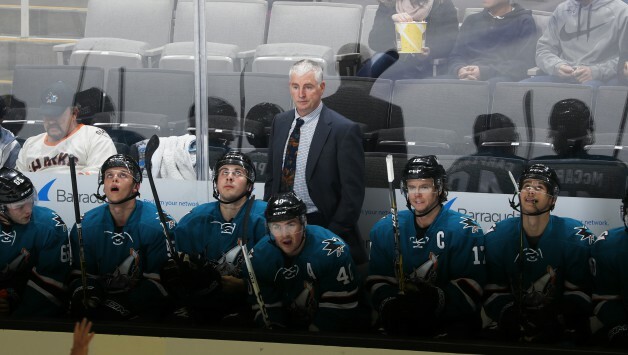 The 60-year-old Sommer is coaching in his 20th AHL season — all with the AHL affiliate of the San Jose Sharks, the Barracuda’s parent club in the National Hockey League. In becoming the first AHL coach to reach 700 wins, Sommer also holds the distinction as having coached in the most games in the 82-year history of the AHL. 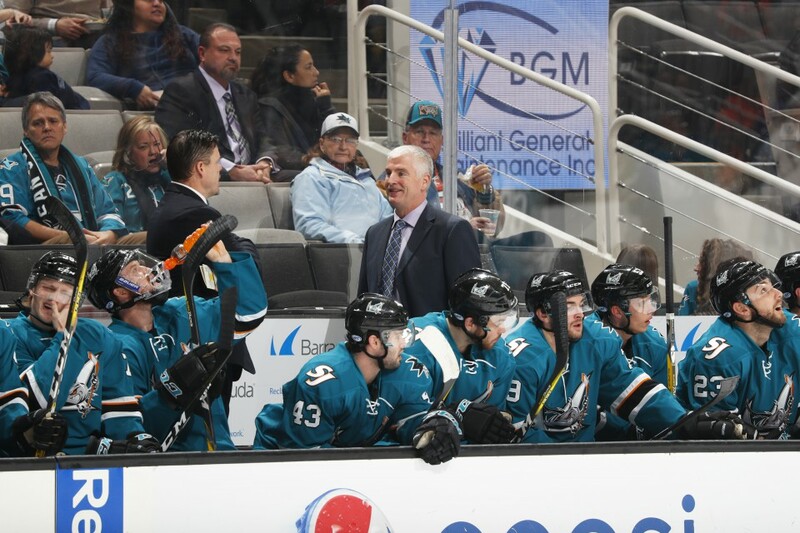 The 700th win marked his 1,499th game behind the bench with the Sharks’ top developmental affiliate. He is the longest-tenured AHL coach with the same organization. “A lot of bus trips,” Sommer reflected on his longevity behind the bench. “It’s kind of been a long road. It’s been a good one. The wins just kept piling up. I didn’t know how close I was until I was walking off the ice the other day and a guy said ‘699.’ It was just one more win. The Bay Area native has racked up many milestones in his nearly four-decade professional hockey career, which now includes 29 seasons as a coach. Sommer spent five seasons and 334 games as a head coach in the East Coast Hockey League (ECHL) with Roanoke and Richmond, winning one Riley Cup championship. Sommer won the Louis A.R. Pieri Memorial Award as the AHL’s Coach of the Year last season after leading one of the AHL’s youngest rosters (average age 23.54 years) to the league’s second-best record at 43-16-4-5 (.699 winning percentage). San Jose ended the season with 12 rookies, four second-year players and four non-rookie first-year AHL’ers. But age was only a number, as the Cuda proved with a 14-game winning streak and 15-game consecutive points steak – the longest in the AHL during the 2016-17 season. San Jose defeated the Stockton Heat and San Diego Gulls in succeessive playoff series to reach the Calder Cup Western Conference Finals against the eventual Calder Cup champion Grand Rapids Griffins. 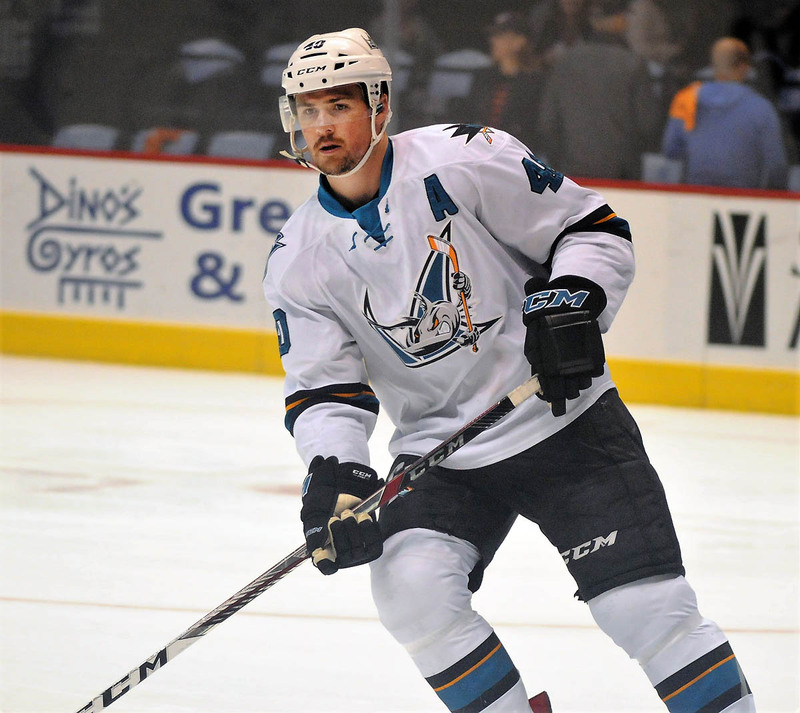 It marked the farthest a Sharks’ AHL affiliate had advanced in the Calder Cup playoffs. Not surprisingly, the Cuda reaped a wealth of awards, including the Bud Poile Trophy as regular season Western Conference champions and the John Chick Trophy as Pacific Division regular season champions. On an individual level, goaltender Troy Grosenick received the Aldege “Baz” Bastien Award as the league’s outstanding goaltender while Daniel O’Regan received the Dudley “Red” Garrett Award as the AHL Rookie of the Year. Sommer topped it off with the AHL Coach of the Year award. Drafted by the Toronto Maple Leafs in the sixth round (101st overall) in the 1977 NHL Amateur Draft, Sommer played 10 professional seasons in the International Hockey League, Central Hockey League, Pacific Hockey League, AHL and NHL. He played three games for the Edmonton Oilers in 1980-81, scoring one NHL goal. His playing career ended in 1987 with the IHL Muskegon Lumberjacks. His legacy, however, was cemented in the coaching arena. Sommer won an ECHL championship with the Richmond Renegades in 1994-95 in his fourth season as a head coach. He coached one season in Roller Hockey International with the San Jose Rhinos in 1996 and served two years as an assistant coach with the Sharks from 1996-98 before embarking on his history-making trek in the AHL. Sommer has coached the Sharks’ primary developmental affiliate during incarnations as the Kentucky Thoroughblades (1998-2001), Cleveland Barons (2001-06), Worcester Sharks (2006-15) and San Jose Barracuda (215 to present). His all-time AHL coaching record is 700-613-48-72-66 (W-L-T-OTL-SOL). From his length of service in the Sharks organization, it’s evident that Sommer has a true love and passion for the game of hockey, and takes pride in what he does, which is to develop young prospects for duty in the NHL. Numbers show he’s done his job well. Sommer has coached 127 players who have gone on to play in the NHL. The Sharks currently have 11 players on their roster who have played for Sommer with the AHL Barracuda over the last two seasons, including eight players who played on the Cuda’s Western Conference Finals squad in 2016-17. Sommer had a direct impact on the Sharks reaching the Stanley Cup Final in 2016. This year’s NHL training camp was especially competitive from the perspective of the Cuda’s young guns, five of whom had a realistic chance of making the opening night roster. Current Sharks who have come up through the system under Sommer’s tutelage include captain Joe Pavelski as well as forwards Logan Couture, Melker Karlsson and Chris Tierney and defensemen Justin Braun and Dylan DeMelo, all from Worcester. Former Barracuda players who have made the transition to the NHL include forwards Kevin Labanc, Ryan Carpenter, Barclay Goodrow and Timo Meier, defensemen Tim Heed and Joakim Ryan, and goaltender Aaron Dell. Carpenter excelled in last year’s Calder Cup playoffs, leading the team with nine goals and 17 points in 15 games. He’s appeared in 14 games this season for the Sharks. Sommer’s 1,833 career games behind the bench place him only behind Scotty Bowman (2,141), and Barry Trotz (1,869) all-time for games coached in the three active highest levels of professional hockey in North America (NHL, AHL, ECHL). Bowman spent a record 30 years as a coach in the NHL; Trotz, the current head coach of the NHL Washington Capitals, is in his 24th year as a head coach in professional hockey, including 19 in the NHL and five in the AHL. Bowman sent Sommer a congratulatory video message after Sommer recorded No. 700. Pavelski scored his 300th NHL goal while Dell made 39 saves to brace the Sharks in their 2-1 win at Florida on Dec. 1. Goals by Cavan Fitzgerald and Manuel Wiederer, combined with 30 saves from goaltender Antoine Bibeau, nudged the Barracuda past the Condors to enable Sommer to collect his milestone 700th career AHL win. The history-making win raised the Barracuda’s record to 9-8-0-1 on the current season. San Jose sits in the middle of the pack in what should be a fiercely competitive Pacific Division playoff chase in 2017-18. The top four finishers in the division standings qualify for the Calder Cup playoffs. The Cuda has made the playoffs during the previous two seasons since moving operations to the West Coast. Because the Sharks and Barracuda share the same building for practices and games, should injuries occur at the NHL level, the Sharks have a great insurance policy with ready-to-step-up talent at the AHL level. The player pipeline continues to run both ways this season for the Barracuda. Forward Marcus Sorensen received a call-up to the Sharks on Dec. 2, while O’Regan was returned to the AHL team on Dec. 8. Sorensen, 25, led all Barracuda skaters in points (14) and ranked in a tie for second on the team in goals (five) and assists (nine) at the time of his recall. In 2016-17, his first season in North America, Sorensen skated in 19 regular season games with the Sharks, collecting four points (one goal, three assists). 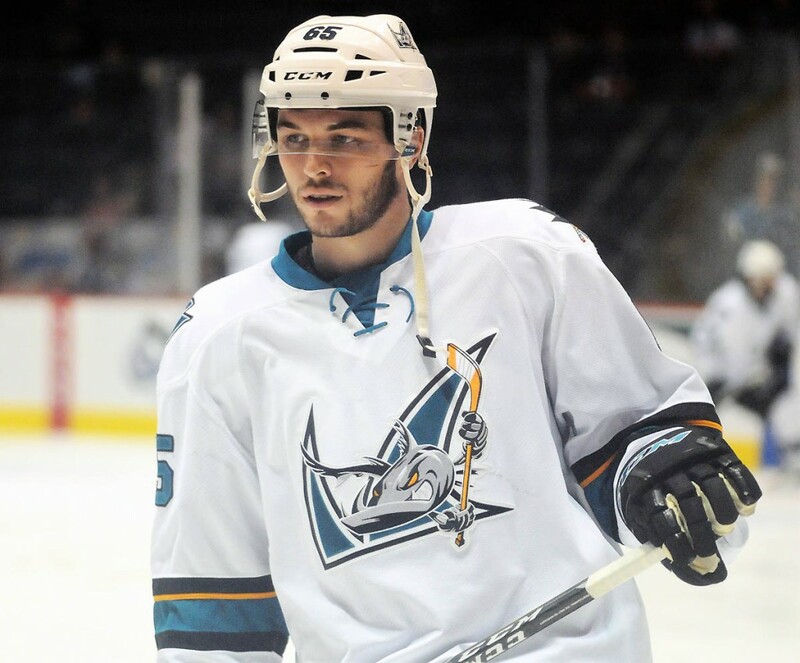 He played in all six of the Sharks playoffs games last season, scoring one goal and one assist. In eight games with the Sharks, O’Regan, 23, collected four assists and five shots on goal. His stint in the NHLwas highlighted by a two-assist night against Tampa Bay on Dec. 2. At the time of his recall on Nov. 18, O’Regan led the Barracuda in points (12) and goals (six), ranked in a tie for third in assists (six) and second in shots on goal (29) in 12 games played. The Sharks reassigned Bibeau to the Cuda on Nov. 30 — just in time to backstop the team to Sommer’s 700th career AHL win. In 12 games with the Barracuda this season, Bibeau, 23, has a 6-4 record, including two shutouts, a 2.14 GAA and .921 save percentage. The Barracuda currently has nine rookies on its roster, including forward Rudolfs Balcers, who leads the team in scoring with 15 points (three goals, 12 assists) in 20 games. His three power-play goals top the team. Among other rookies on the team, defenseman Jeremy Roy has collected seven points (two goals, five assists) in 16 games, while center Alexander True has recorded six points (three goals, three assists) in 20 games. Fitzgerald has six points (two goals, four assists) in 19 games this season. The Sharks drafted Roy in the second round (31st overall) of the 2015 NHL Draft; Balcers, from Latvia, was a fifth-round pick (142nd overall) in the same draft. Balcers, 20, made a good first impression during the NHL Prospects Showcase during rookie camp when he scored three goals and added an assist in a 7-4 win over the the defending tournament champion Colorado Avalanche. Sommer, who coached the Sharks prospects at the four-team tournament in September, rated Balcers high on his skills set. “He’s opened some eyes, that’s for sure,” the Cuda coach noted. Balcers, who signed an entry-level contract with the Sharks in July, had 40 goals and 37 assists in 66 games for Kamloops of the Western Hockey League (WHL) last season, his first in North America after playing two seasons in Norway. •Gardena’s Beau Bennett earned first star of the game honors in the Chicago Wolves’ 3-1 win over the visiting San Diego Gulls on Dec. 6. Bennett, whose NHL credentials include a Stanley Cup championship with Pittsburgh in 2016, tallied what proved to be the game-winning goal midway through the second period. In 15 games for the Wolves this season, Bennett has collected three goals and nine assists for 12 points to rank in a tie for third in team scoring. He has played in six NHL games this season for the St. Louis Blues, going scoreless. •Los Angeles native Brett Sterling has appeared in 10 games with the Wolves this season, recording four goals and one assist. This is Sterling’s seventh season in Chicago. He appeared in 61 games last season, with 11 goals and 29 points. He made his professional debut with the Wolves in 2006-07, recording 55 goals and 97 points in 77 games. 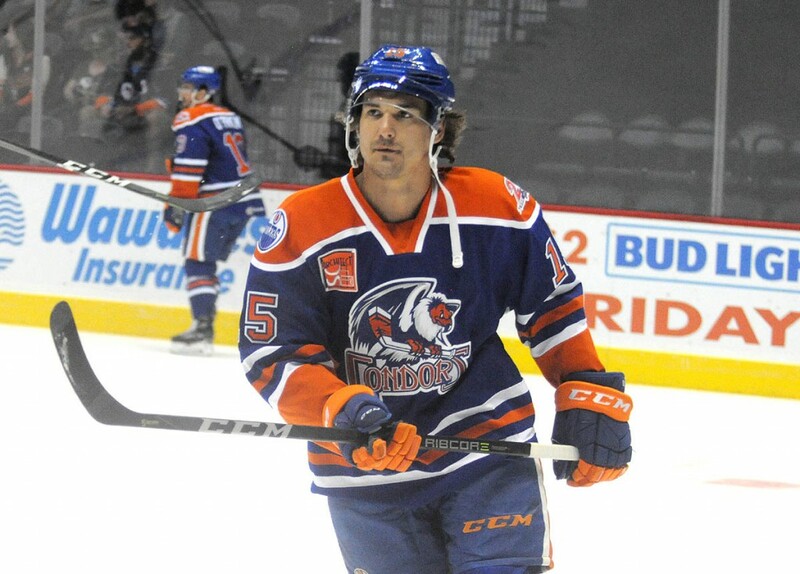 •Whittier’s Mitch Callahan recorded a three-point night (one goal, two assists) in the Bakersfield Condors’ 5-1 road victory at the San Antonio Rampage on Dec. 5. It was the second consecutive road game in which Callahan, a right wing, scored a goal. •A pair of Golden State products – goaltender Eric Comrie (Newport Beach) and right wing Chase De Leo (La Mirada) – have helped the Manitoba Moose to the best record in the Western Conference (17-5-1-1, .750 winning percentage) through 24 games. Comrie, who received a call-up to the NHL parent Winnipeg Jets on Nov. 27, has posted an 8-4-1 record with one shutout, a 2.30 goals-against average and .927 save percentage in 13 games while De Leo has collected five goals and 13 points in 24 games this season, scoring one power play goal and holding a plus-6 rating. Comrie made 30 saves and De Leo scored the game-winning goal in Manitoba’s 3-0 shutout victory at Milwaukee on Nov. 25. •San Diego native Thatcher Demko, a second-round draft pick by the Vancouver Canucks in 2014, boasts an 8-5-2 record with one shutout, a 2.50 GAA and .920 save percentage for the Utica Comets in 15 appearances. 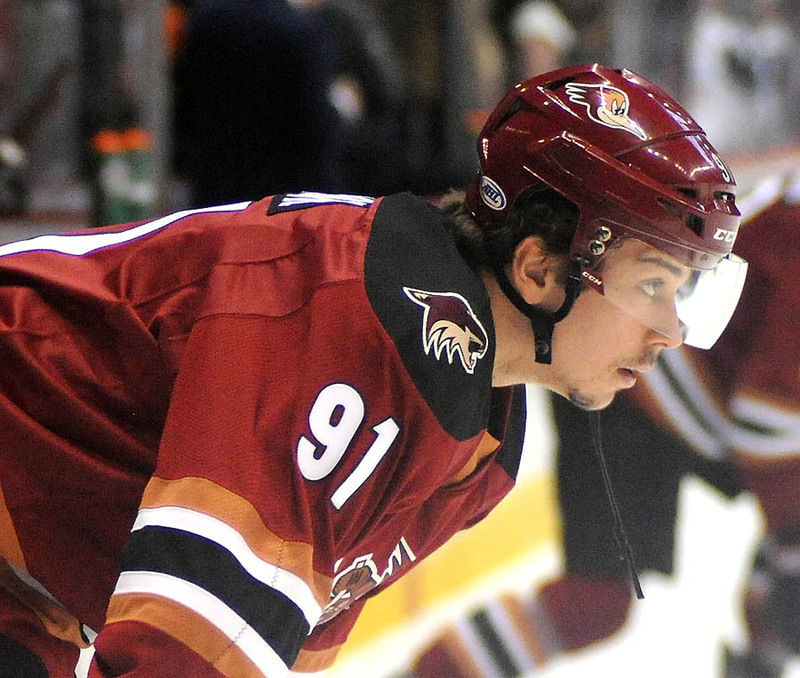 Tucson forward Dylan Strome received honors as the CCM/AHL Rookie of the Month for November after collecting seven goals and nine assists for 16 points in nine games during the month while helping the Roadrunners to first place in the Pacific Division standings. The 20-year-old native of Mississauga, Ont., was recalled by the parent Arizona Coyotes on Nov. 26 and appeared in two NHL games to finish the month. He has now appeared in seven NHL games with the Coyotes this season. He scored his first NHL goal on Dec. 2 in a 5-0 victory against the visiting New Jersey Devils. At the time of his recall, Strome, the third overall pick in the 2015 NHL Draft, was tied for the AHL lead with 18 assists, tied for second place with 26 points and tied for fifth with a plus-13 rating in just 15 games for Tucson this season. The Roadrunners (12-4-2-1, .711 winning percentage) remained in first place in the Pacific Division standings following a 3-1 win over the host Barracuda on Dec. 8. The Arizona visitors swept the three stars of the game awards. Michael Bunting earned first star billing with two goals while second star selection Hunter Miska made 33 saves on 34 shots. The visiting Stockton Heat handed the Barracuda a 6-0 defeat on Dec. 6 to remain in second place in the division standings. Rookie Spencer Foo earned the first star of the game award with a hat trick, while goaltender Jon Gillies stopped all 25 shots he faced to collect his second shutout of the season. Tyler Wotherspoon recorded one goal and one assist to help boost the Heat (13-6-0-2, .667 winning percentage) to the victory. San Diego announced Dec. 8 that the AHL club had traded right wing Spencer Abbott to the Binghamton Devils in exchange for future considerations. Abbott, 29, has played in 273 career AHL games with San Diego, Rockford and Toronto, registering 217 points (73 goals, 144 assists) with a +8 rating and 60 penalty minutes. He had collected 20 points (six goals, 14 assists) in 17 games with San Diego this season to lead the club in scoring.